The Centers for Disease Control and Prevention says inadequate iron is the most common nutritional deficiency in the United States. Adult men need 8 milligrams daily, while women between 19 and 50 years old should have approximately 18 milligrams per day. If you lack iron, you may be more likely to develop anemia or neurological problems. Vegans and vegetarians need to be especially careful, because plant-based sources of iron are not as easily absorbed as iron from animal-based foods. Talk to your doctor if you're concerned about your iron intake. Shellfish such as clams, oysters, shrimp and mussels are some of the richest natural sources of heme iron, the form of animal-based iron that your body readily absorbs. 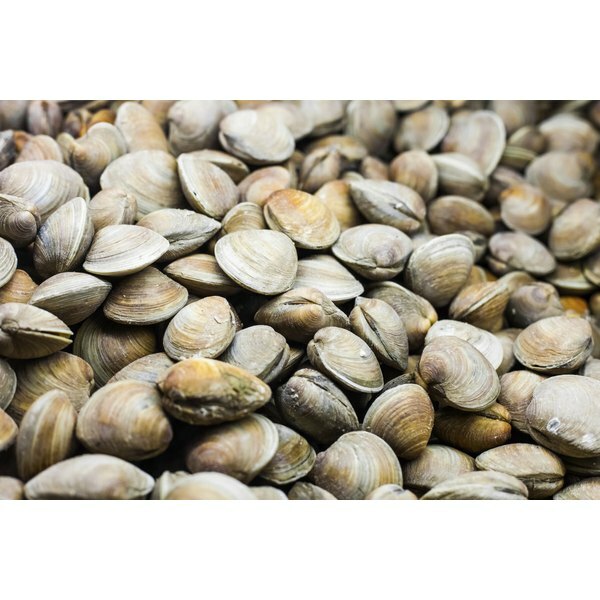 Canned clams contain nearly 24 milligrams of iron in every 3-ounce serving; 3 ounces of cooked oysters contain about 10 milligrams of the nutrient. The Monterey Bay Aquarium's Seafood Watch advises that you choose oysters that are wild-caught in the United States or farmed clams, mussels or shrimp to ensure that you're consuming shellfish that is low in contaminants like mercury. A 1/2-cup serving of cooked soybeans contains 4.4 milligrams of iron, or more than half of the recommended daily intake of iron for men and about 24 percent of the requirement for women under 50. Cooked white beans offer 3.9 milligrams in each 1/2 cup, while a similarly sized serving of lentils contains 3.3 milligrams of iron. Other high-iron beans include black, adzuki and pink beans. If the beans are prepared with vegetables high in vitamin C -- canned tomatoes, for example -- your body will obtain more iron from each serving. Seeds such as roasted squash or pumpkin kernels have a high concentration of iron, with 4.2 milligrams in each ounce. For a woman under 50, this amount fulfills 23 percent of her daily iron needs; for a man, it supplies 52 percent of his requirement. Combine a mixture of unsalted seeds with dried apricots for a nutritious, easily portable snack high in iron. Every cup of dried apricots contains 7.5 milligrams of iron -- nearly 100 percent of a man's recommended daily allowance and 42 percent of that for women between 19 and 50. Lean cuts of beef keep your fat and cholesterol intake low while giving you a healthy dose of heme iron. A grass-fed beef tenderloin steak may contain as much as 3.32 milligrams of the mineral, fulfilling 41 percent of a man's RDA and 18 percent of the RDA for women under 50. A 3-ounce serving of other lean beef cuts, such as top round steak or porterhouse steak, supply around 2.75 to 2.77 milligrams of iron. Limit your consumption of red meat to two 3-ounce servings weekly to keep your risk of cancer and heart disease low.